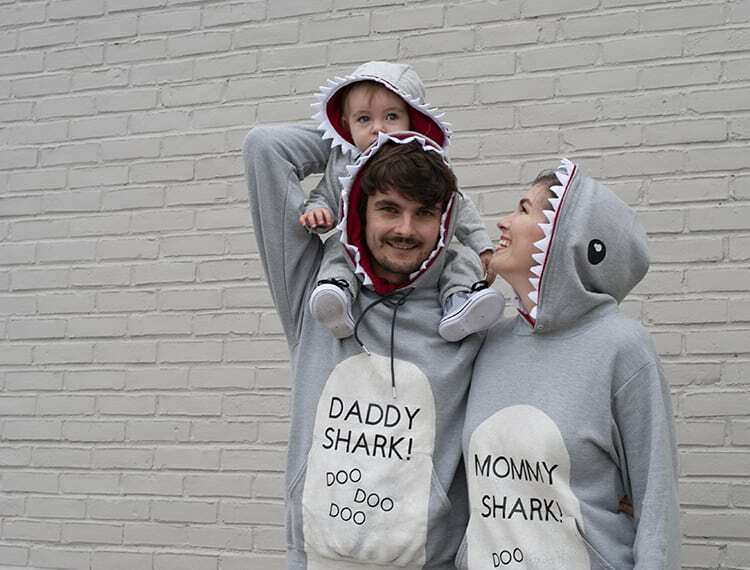 Read more: Learn how to sew a baby shark song costume. I am SO dang excited about our Halloween costumes this year! But first, a note: Photos of the three of us are by Maria Vavilova Photography and edited by me. Others I took myself. Thanks, Maria! And one more quick thing: if you’re looking for another baby Halloween costume idea, check out Cricket’s DIY Sophie the Giraffe Halloween costume from last year! Yeah, yeah, it’s stuck in your head now. I’m sorry. 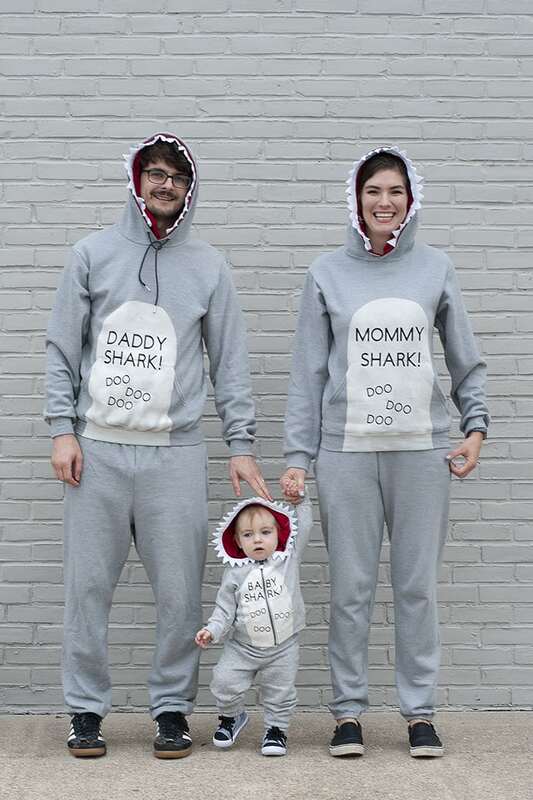 Now that we’ve got that all cleared up, I MADE A BABY SHARK COSTUME FOR ALL THREE OF US! 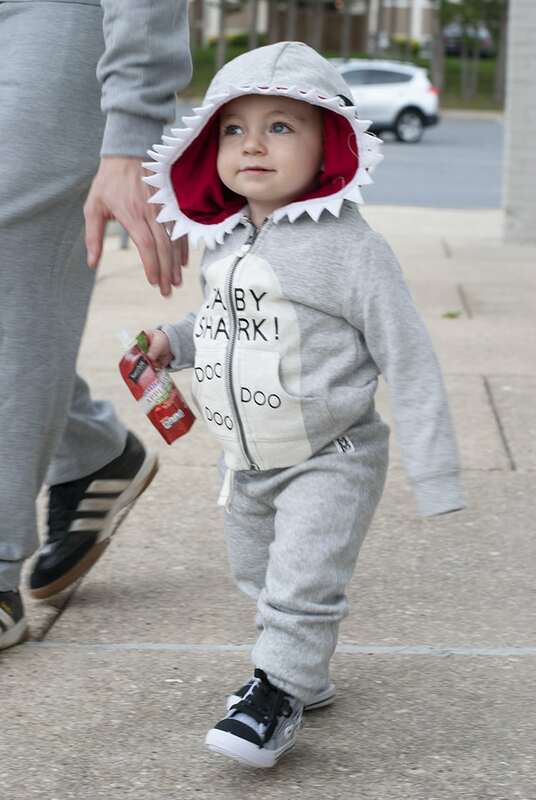 And Pippa’s a shark, too, of course. 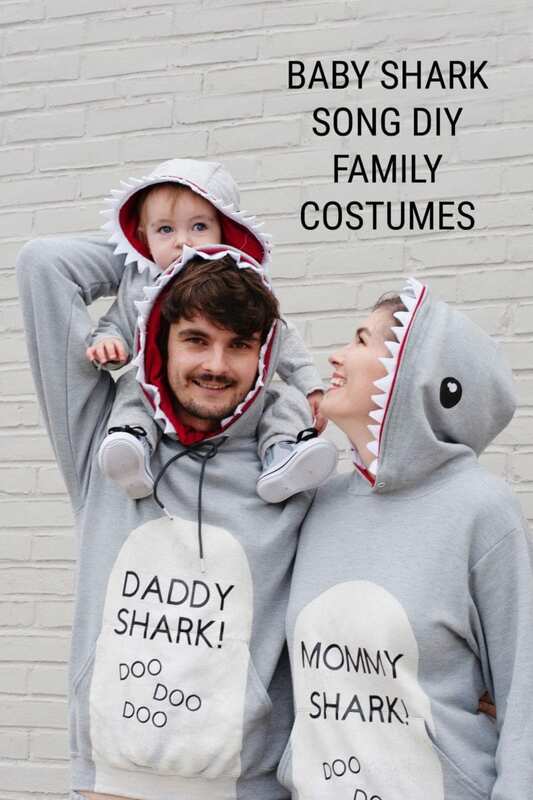 Where to Buy a Baby Shark Song Costume for the Family Instead of DIY? 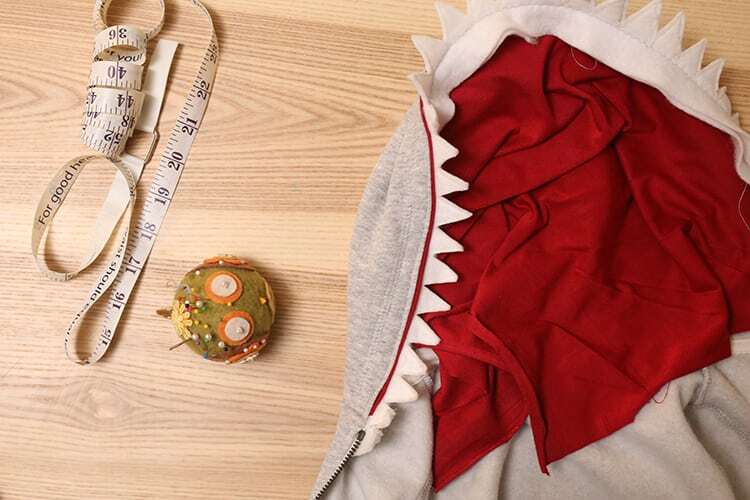 Well, #sorrynotsorry for all the photos you’re about to have to scroll past to learn how to sew a shark costume. I couldn’t pick. They were all too stinkin’ cute! 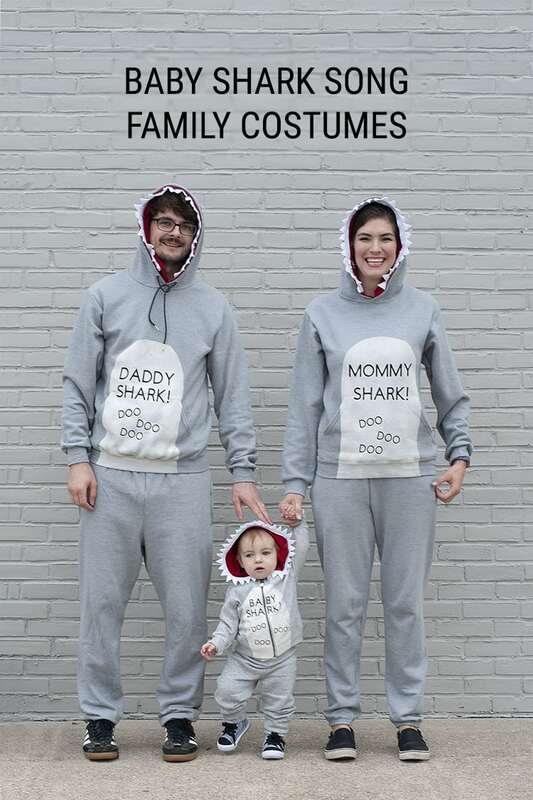 The great thing about this family Halloween costume idea is that since it’s a hoodie costume, it’s warm and cozy. 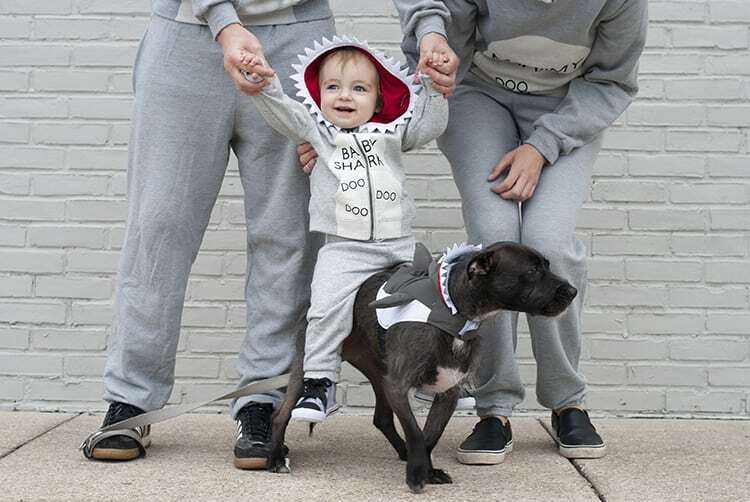 Your little ones — and you — won’t be freezing your fins off while you’re out trick-or-treating! 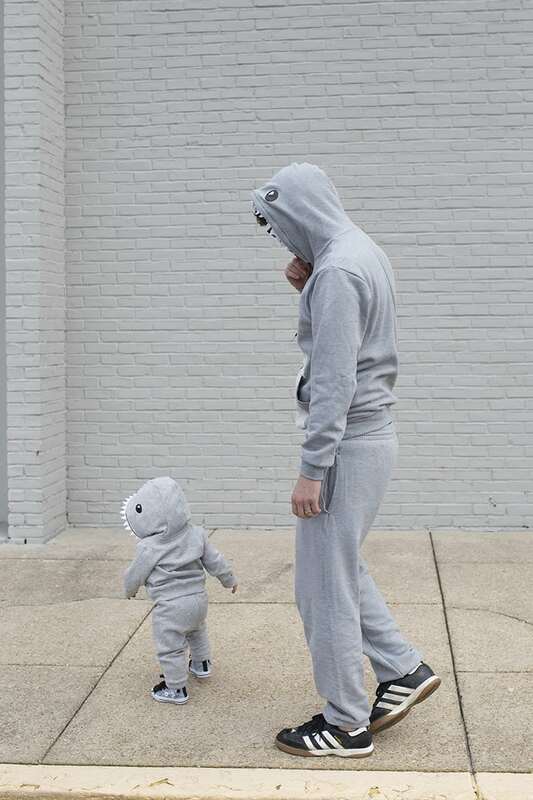 These are the exact sweat suits I used — both the baby and adult versions. I’ve also linked to the exact supplies I used (like the fabric spray paint) or the closest available online product for ones I couldn’t find online. The list contains affiliate links, so I could make a commission, but it won’t cost you anything extra. 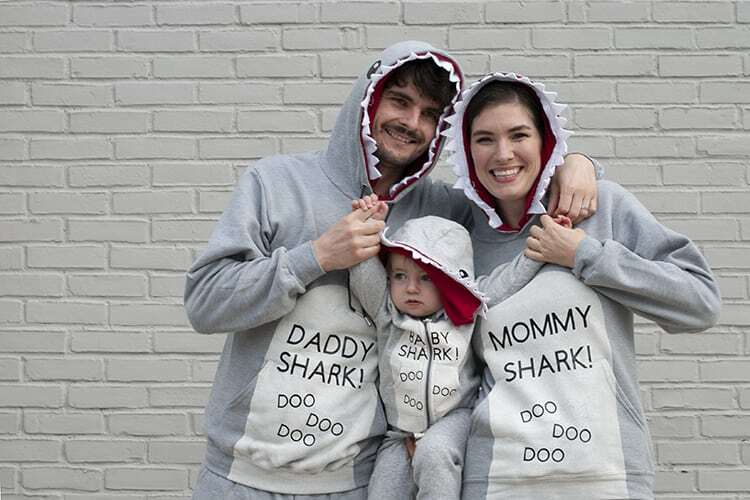 I used 26″ x 4″ for the 18-month hoodie. I used 33″ x 4″ for the adult hoodies. 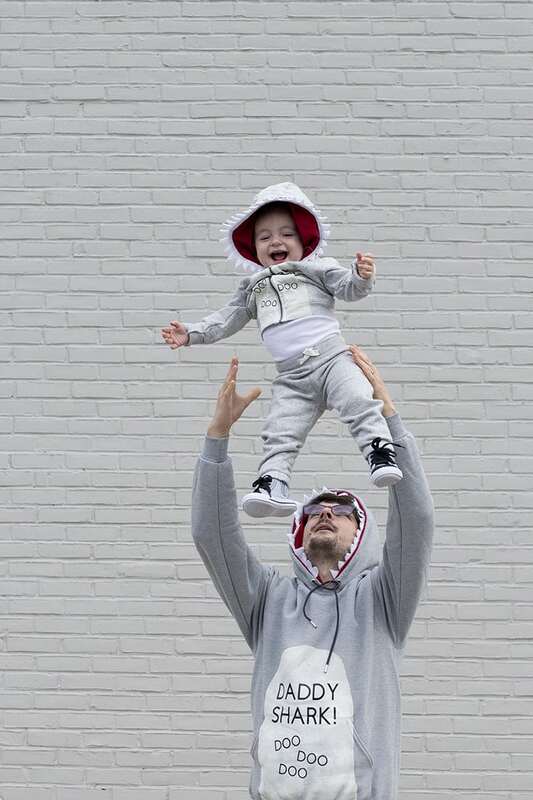 * You can use whatever black iron-on letters you like, but you’ll need to get extra to have enough of the letter “O.” To give you an idea for sizing, my letters for the adult hoodie are 1.5″ and 1″ tall and for the toddler size are 1″ and 0.5″ tall! 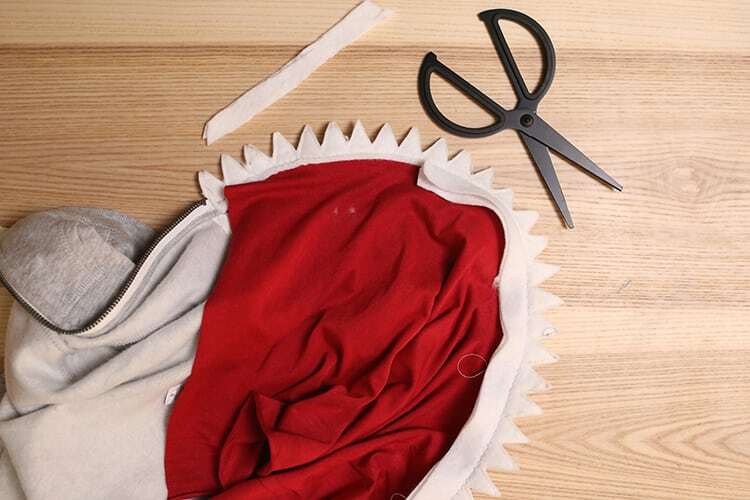 I modified this great DIY shark costume tutorial to do the teeth. Check it out in case you want to skip the red fabric! 1. 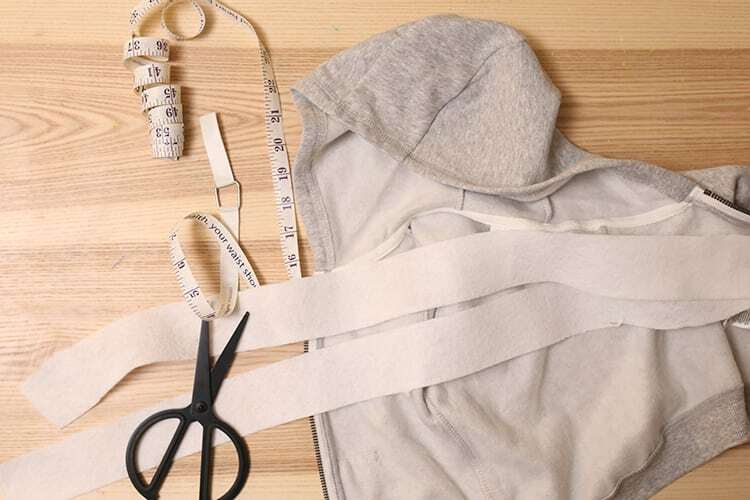 Measure the hood of a hoodie while folded in half, and then double that measurement. Add two inches to the length. 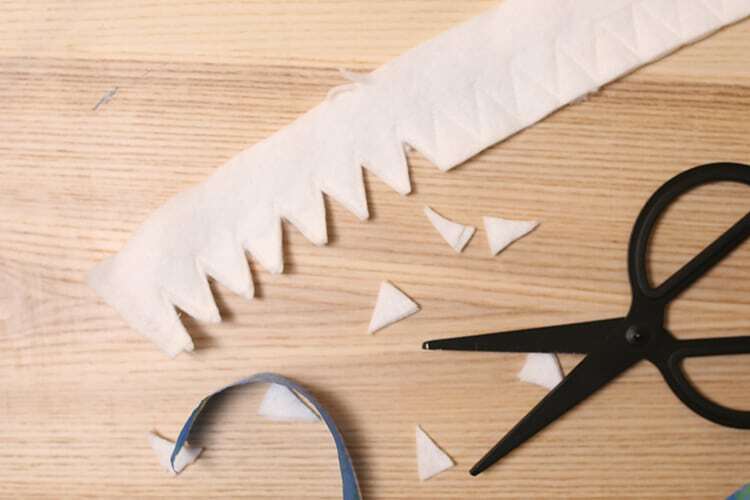 Cut two strips that length by two inches wide. 2. Add a strip of painter’s tape along the length of one piece of felt to create a straight line. Use a measuring tape to add dots with the market to the painter’s tape to create evenly-spaced guides to sew the teeth. I made a dot every one inch. 3. Lay the taped strip of felt on top of the other piece, and use a sewing machine with white thread and a straight stitch to sew a zigzag. You’ll sew up to the edge of the painter’s tape at every dot. Cut out the extra triangles from under the zigzags after you’ve sewn the full row of teeth. 4. 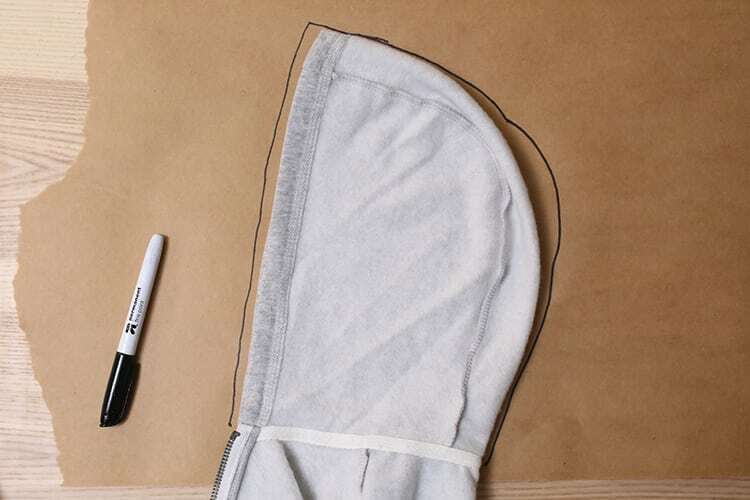 Fold the red fabric in half, and mark the long edge at the same hood length you calculated in Step 1. Cut a triangle with the folded side being the long edge. Iron the red fabric to press down the fold. 5. Sandwich the folded edge of the red fabric between the hood and the teeth, and pin the layers in place together. Use grey thread and a zigzag stitch to sew the layers together. 6. Cut away the extra felt from the teeth inside the seam, like at the top of the above image. 7. 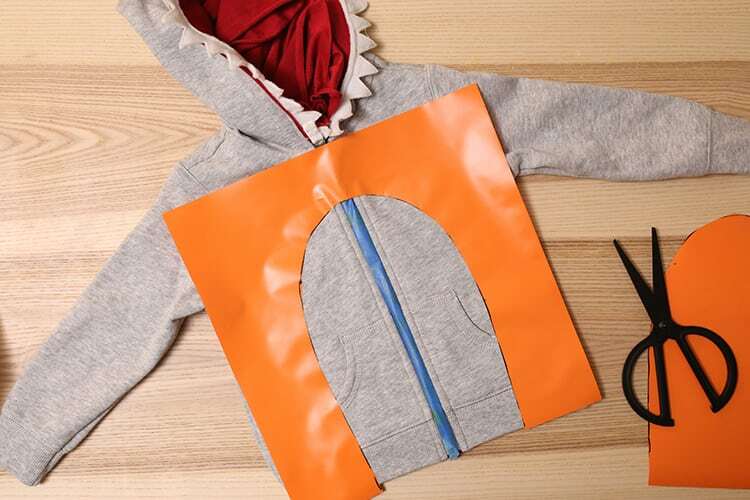 If your hoodie has a zipper, tape over it with painter’s tape. 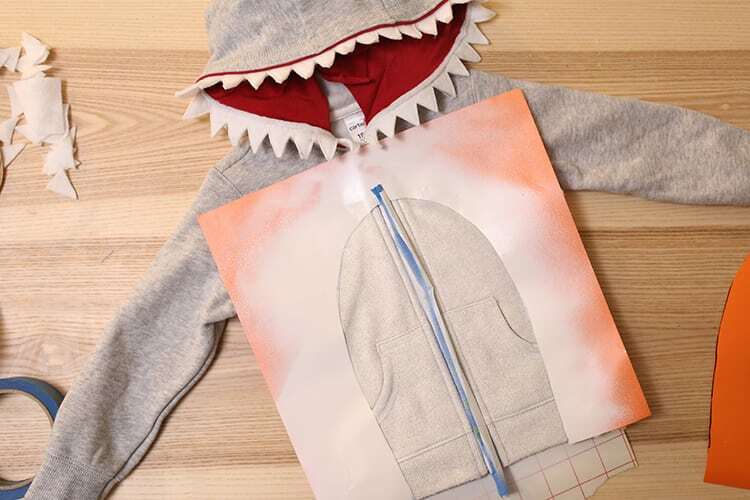 Cut a half-over tummy shape out of adhesive vinyl for a baby- or kid-sized hoodie, and stick it onto the hoodie. Press it down firmly to keep any paint from bleeding under. For an adult size, you can cut the shape out of butcher paper, wrapping paper, or something similar. Stick painter’s tape around the inside edges, and trim the tape into a smooth oval shape. Stick the tape onto the hoodie, and press it down firmly. 8. 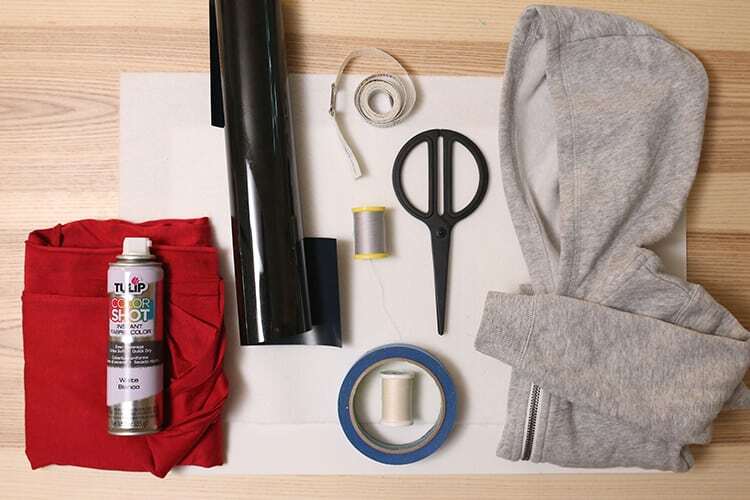 Put a piece of cardboard or heavy paper inside the torso of the hoodie to keep any paint from bleeding through. Spray the tummy white with several thin, even coats. Tip: You can’t tell from the above photo, but I covered the hood and sleeves with paper to protect them from any spray. 9. Cut out the following words from black HTV in your favorite font. I used Cricut Sans for this one. 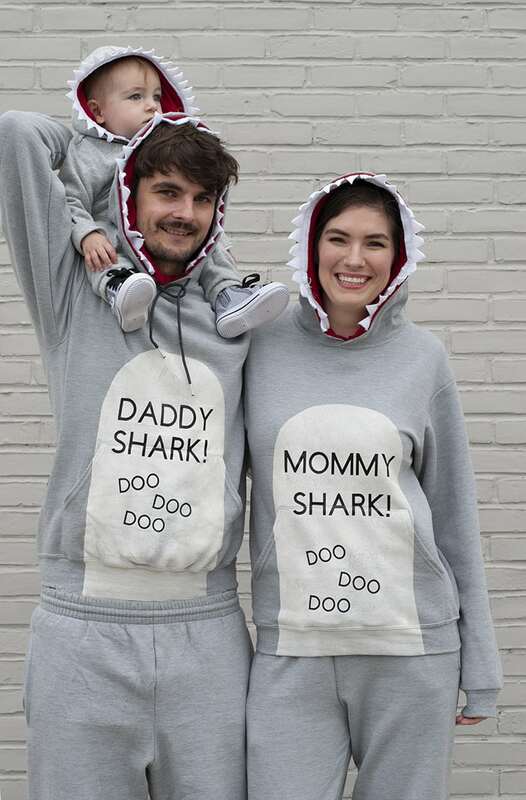 You want the DOO DOO DOO to be around half the size of the other words, and the baby or kid version of the phrase will be smaller than the adult version so that the letters fit on the chest. Iron them down with a lot of pressure, pressing until you can see the texture of the fabric underneath the letters. 10. Finally, cut eyes out of the HTV as well. I did a big circle on either side of the hood. I cut little circles out from the bigger circles to leave an empty space. After you iron on the eyes, you can paint the insides of the empty circles with white to give the eyes a cute (instead of scary! ), sparkly effect. Hi! Love your costumes!! Did you have a hard time ironing on top of the white fabric spray? I used the same spray as you and now im up to ironing and the fabric is very hard to move the iron on so the letters are not transferring. Any tips?? Hi. 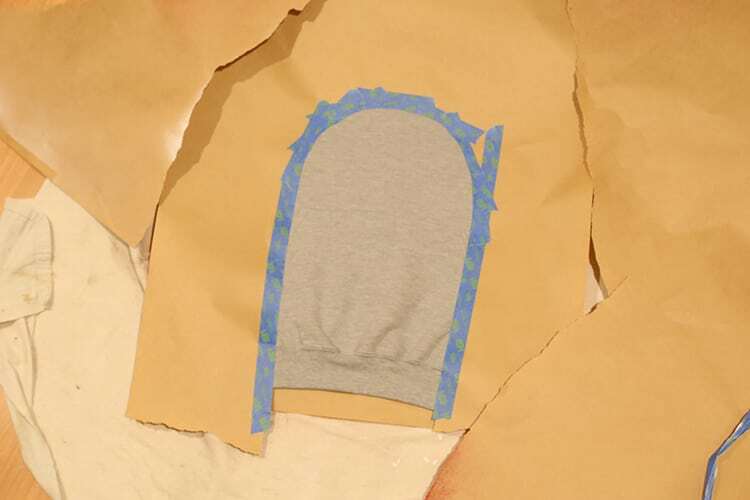 Can you include a link for the letter stencils you used for both size sweatshirts please? 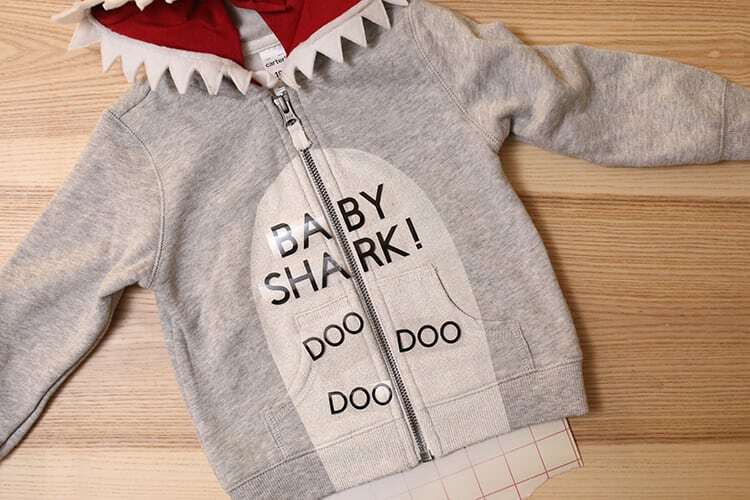 To give you an idea for sizing, my letters for the adult hoodie are 1.5″ and 1″ and for the toddler size are 1″ and 0.5″! How much red fabric did you use for each hoodie? So cute! Do you think I could use fabric glue to fuse the teeth together? The sewing of the individual teeth seems like a lot! Yeah that would probably work! I decided to sew them just because I already had to see them onto the hoodie, but originally I wanted to do a no-see version! Love these costumes!! Can you tell me what size your letters are for the words? Thank you! 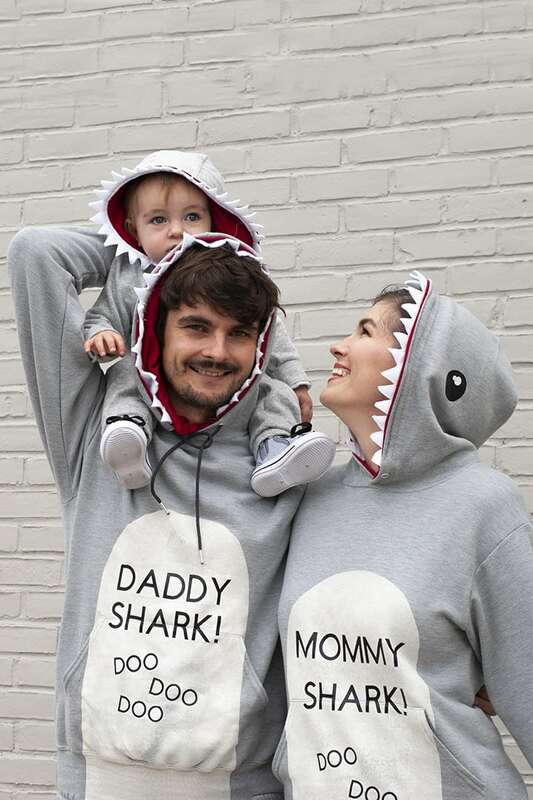 What size letters did you use for bothe the kids and adult costumes? Was it the same here? Hi Heather! That seems a bit off to me. Have you shaken it really well? I was able to do the baby hoodie and an adult hoodie with one can. I needed a second can for the second adult hoodie and then used it for touch ups, but one can should go further than it’s going for you! All I can think of is to shake it really frequently. P.S. I’d love to see the costumes when you’re done! 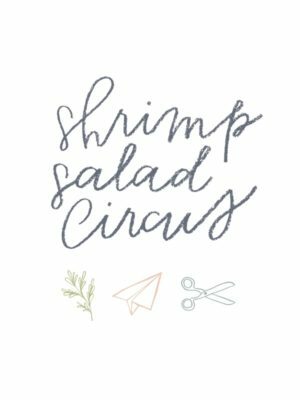 You can tag me on a Instagram @shrimpsaladcircus and #shrimpsaladcircus! 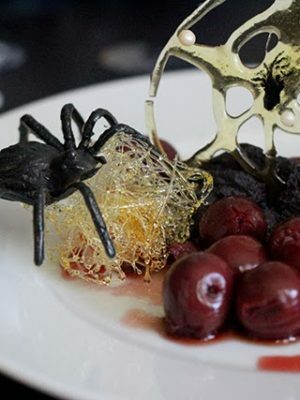 Any chance I can pay you to make these??? So adorable! Thanks so much, Melanie! I wish I could but I’m too dang busy! ? Haha I wish I could! Too busy with my day job! ? Hi Lindsay, this is an amazing idea and thank you for posting step by step procedure. I am a beginner at diy & sewing. could you please help me out with the letters ? 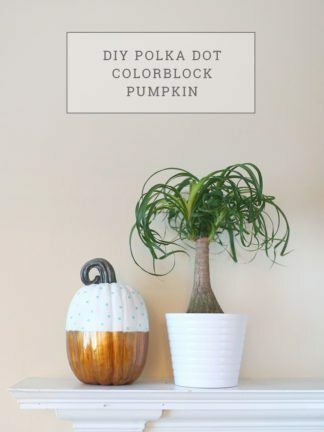 I don’t have a cricut or have any experience around this? Please could you provide alternatives to putting those letters on the jacket ? Hi Preethi — Thank is so much for your sweet comment! You can buy premade iron-on letters at Michaels or any craft store. Or you could even just paint the words! If you paint them, you can use a black acrylic paint and a small/medium (depending on letter size) round brush. Sweet. Thank you Lindsay ! Thanks you for your concern, Janet. Please take another look at the photo, as you can clearly see that our daughter is being supported by each of us on either side. None of her weight was on the dog, as I make a point of not using my child or pets as photo props. Our dog Pippa is very well loved and very well cared for. She adores our daughter, and they love to play together. I thank you for being an animal lover (like myself) and encourage you not to be so quick to pass judgment in the future. ? This is great! How much of the red jersey did you use? Thanks so much, Abby! The red is just a rectangle that hangs loose at the back. You can measure the length of the hood (same as for the teeth) and then for the width, measure from the front of the hood down to the neck. Leave a bit extra to fold over for the front seam. Does that make sense? not really, but I’ll figure it out. I had bought all the supplies, but the red jersey. I went ahead and bought 2 yards just in case. Am I cutting a triangle or a rectangle for the hood? P.S. I think the teeth are going to be the hardest part of this! Sorry — I’ll try to figure out a way t make it more clear so that I can update the post. I used a rectangle. It hangs loose inside the back of the hood. I’m sure there are better, neater ways to do it, but I’m not much of a sewing expert unfortunately. Neither am I! But I have a sewing machine, so I’ll see what I can do. I’ll let you know how it turns out! I made these costumes! They came out looking JUST LIKE YOURS! I posted on Insta a and used your hashtag. Let me know what you think! Yay! I can’t wait to see them! I don’t see anything in the hashtag though. Did you use #shrimpsaladcircus? You can also tag @shrimpsaladcircus. If your account is private, you might have to DM me. ? This is wonderful! Found this post through a google search. Thanks for the inspiration. 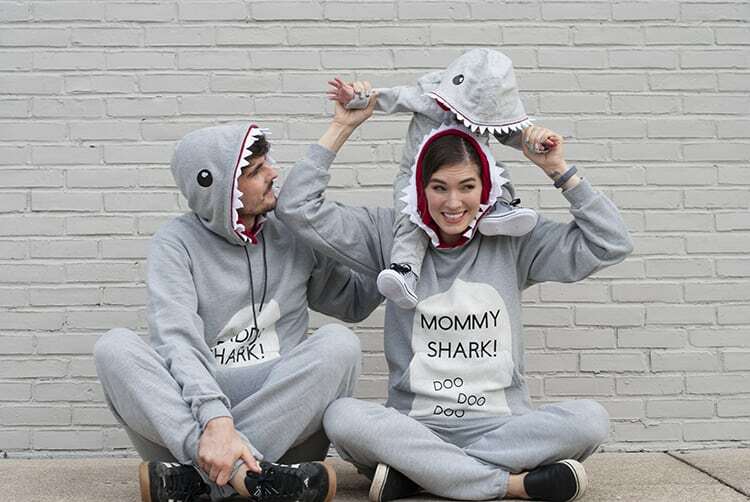 I am getting blue, pink and yellow hoodies for the costume.